Music is my first love, woodworking and building things has always been a very close second. I always gigged a lot in my earlier years but gigging didn't pay all the bills and I wanted to make the rest of my living in the music industry. I hooked up with Charles Fox, now the current owner/instructor at The American School of Lutherie, and studied the art of guitar building. 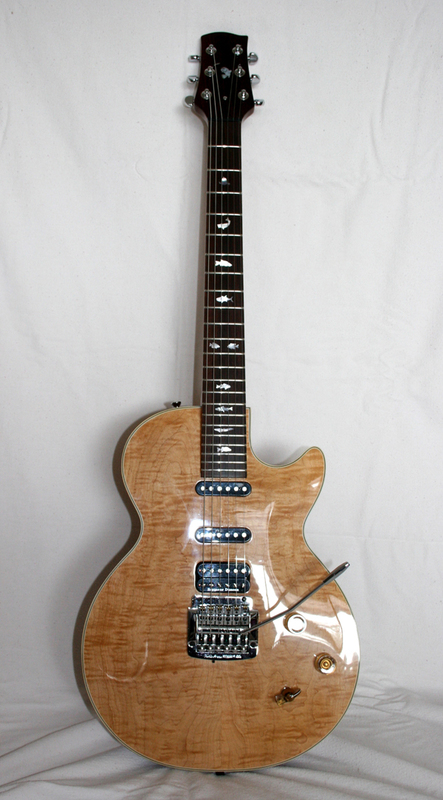 I learned my repair chops working several years at Top Shelf Music in Buffalo and in the 80's and 90's I owned a very busy guitar shop also located in Buffalo. I was a warrantee center for Gibson, Martin and several other manufacturers. I closed up shop in the late 90's to pursue other music related endeavors but I've kept up my repair chops by taking in work from local professionals which I continue to do when I have time. This instrument is my most recent build. It took quite a long time to complete as I only had limited time intervals to work on it. As with most projects if you keep at them step by step sooner or later they will be completed. My philosophy is always to try to bring something new to any project. Hopefully +new+ is an improvement and in this case things worked out quite well. 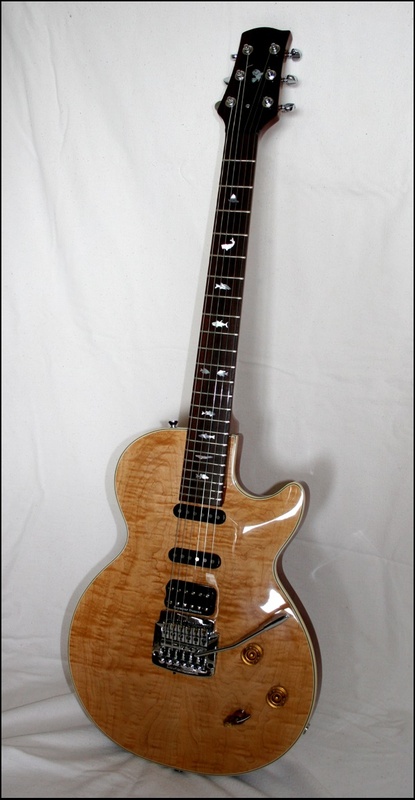 One feature that you won't find elsewhere is that I used the flat top Kahler Vibrato Tailpiece on a carved maple top instead of the Gibson style archtop mount. The reason I did this is because the coupling of the strings to the guitar body is far superior when the bridge is solidly mounted to the guitar top. One of the reasons that a Les Paul sounds muddy and dark is because of the stud mount tailpieces and the losses that they impart to the sound transfer from string to body. You may ask yourself, if it sounds so good, why don't other manufacturers use a solid mount tailpiece on carved top guitars? The reason is simple, the neck angle to the body tolerance has to be within several hundreds of an inch because you can't simply raise the whole bridge for string height adjustment. In woodworking tight tolerances and assembly lines aren't always compatible. 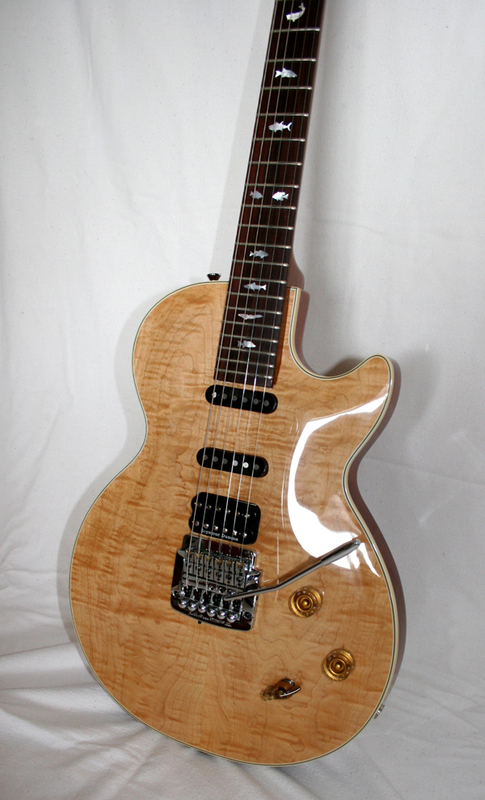 Another feature that you may notice is that the front of this guitar is clean and free from the cheap looking mounting hardware and pickguards that most manufacturers use to mount their pickups and hide their excessive routing. I modified the Seymore Duncan JB model pickup so it could be mounted without a mounting ring and removed the corners of the pickup's bottom plate. I custom engineered the two strat type pickups and fabricated a way to raise and lower the pickups using two stainless steel (non magnetic) screws that are actually in the center of the windings, accessible by two small holes in the covers. This allows for the pickups to be mounted in cutouts that are only a few hundreds of an inch larger than standard strat pickup covers. 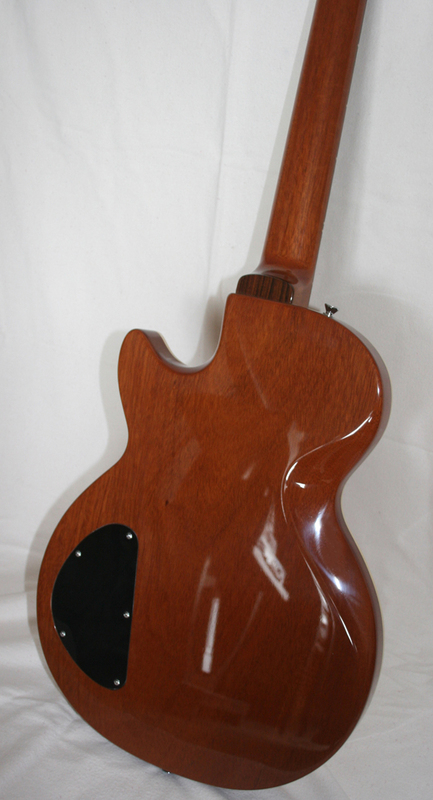 There are no other holes needed in the guitar's back for pickup height adjustments. It looks clean because it is. The pickups were wound using alnico 5 magnets and were wound like vintage 60's strat pickups with a bit more output to match the JB a little better. 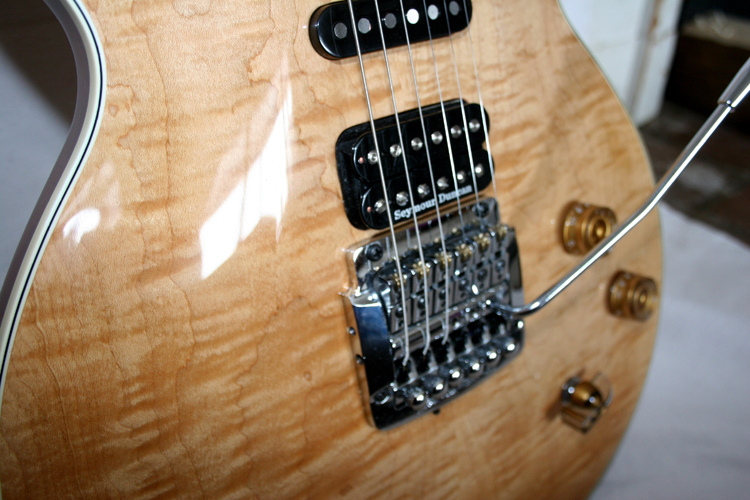 The pickup routing cavities are only deep enough to mount the pickups. 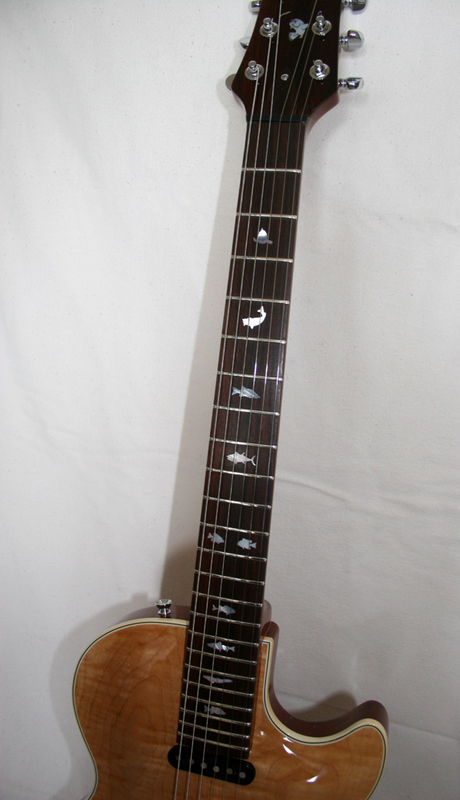 The two strat type pickups were wound with reverse winding and reverse magnet poles so they operate in a true dual single coil humbucking fashion when switched together. 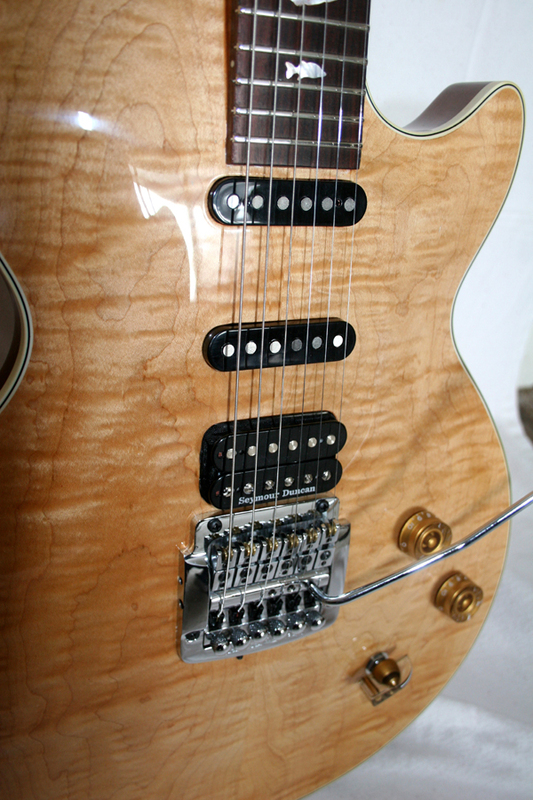 They were also wound so that the bridge and middle pickups are in phase when switched together. superior tone woods from the 70's !! The real deal. years _before_ I bought this wood in the 70's! (also from my wood stash). A Graphite nut is used along with locking tuners in order to allow the omission of the locking nut assembly. In my guitar repair days I installed hundreds of various vibrato bridges. Many included a locking nut assembly. The problem with those is that they shorten the effective string length. By effective string length I do not mean the distance from the bridge saddle to the nut, it's the length of string that effects the response and feel of the string. 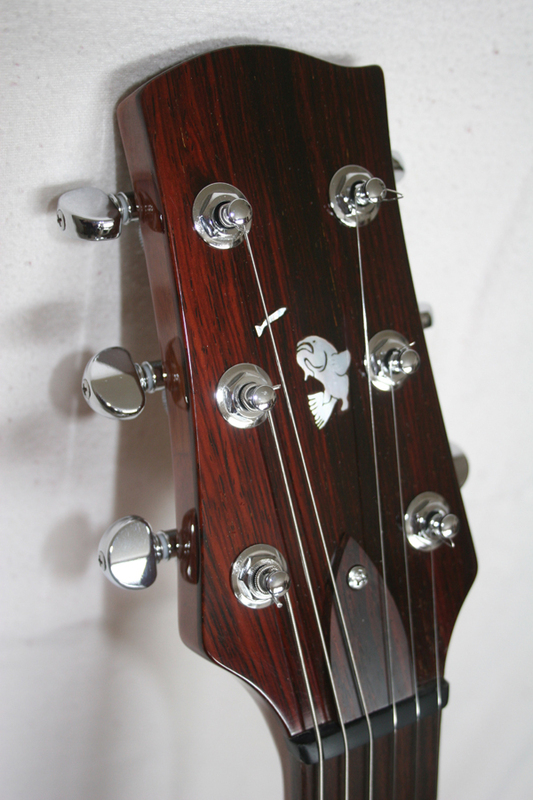 The effective string length includes the string length between the saddle and fine tuners, and, the string length between the nut and the head tuners along with the playing string length. The extra string length on each side of the playing portion of the string has a great affect on the way the string feels as a position is fingered or a bend is made. When a locking nut is used and a string bend is executed the string feels much stiffer than when the string has some extra length behind the nut. With the locking nut the bend has to fight the bridge tension more and in doing so pulls the other strings out of tune which is often audible. This effect is less noticeable when the locking nut is omitted. 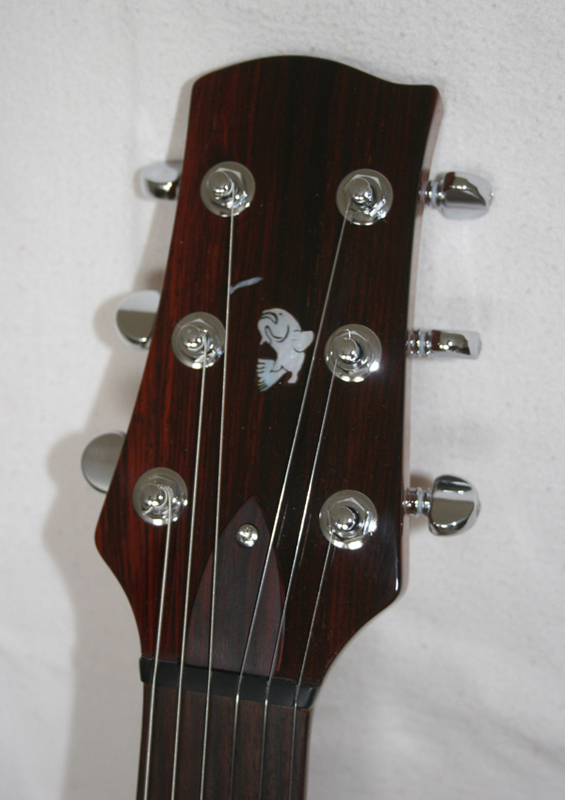 Good geometry, tuners and a well crafted Graphite nut can usually eliminate the need for the locking nut. Some locking nuts require permanent alterations to the neck of the guitar in a critical structural position, completely unacceptable. 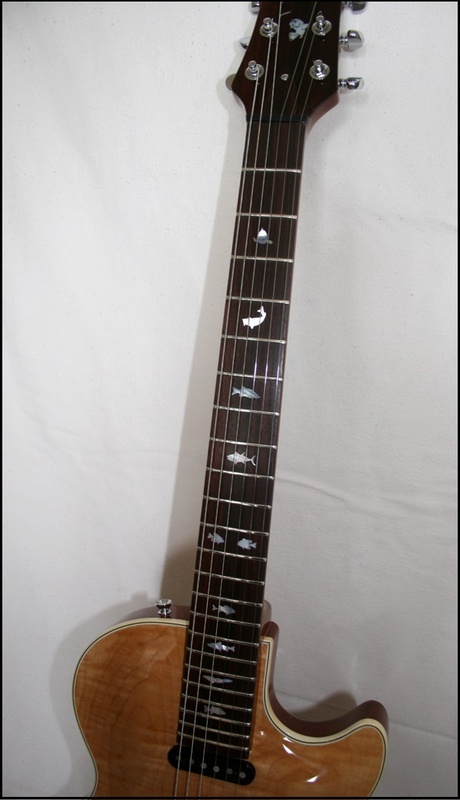 The fish inlays are a personal touch that I included for this guitar's owner, my Brother Paul Preston Jr.. Guitarist in The CPR Band. Blasphemy!!! Seriously, it has all of the articulation of a strat, even a tele, with the balls of the glued neck Les Paul. Even the Drummer raves about the guitar sound. Nuff said. Looks pretty sweet too ! !